It's time for another SUPER FUN, and always very inspiring, Blog Hop at Really Reasonable Ribbon. We are SO glad that you've chosen to "hop along" with us, and we know that you will just love all the amazing projects you see along the way. Don't forget to answer the question on the Really Reasonable Ribbon Blog at the end of the hop so that you'll be entered for the Blog Hop Prize. 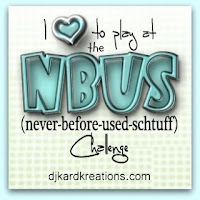 You should have arrived here from the fabulously-talented Bonnie Garby's sweet blog. But in case you didn't, you can go to to get started. If you're not familiar with Really Reasonable Ribbon, you will most definitely want to stop by and take a look. This fabulous company carries all the ribbons, laces and trims a crafter could ever dream of, and more! They also carry a wide selection of paper flowers and decorative embellishments for your projects. If you more the type of person who likes to always have just the right ribbons for the various seasons, you might lean more toward our Monthly Ribbon Club. This is a great way to get a fabulous array of ribbons every month, and they will help you to create fabulous projects that are fitting for every time of year. Here's a peek at this month's collection. So....what does a girl do with all this ribbon, you ask? Well, get creative and ALWAYS put a bow on it. That's my best answer! I think every card or project is always better with a bow on it. I decided on a sweet little hair bow for this month's Blog Hop. 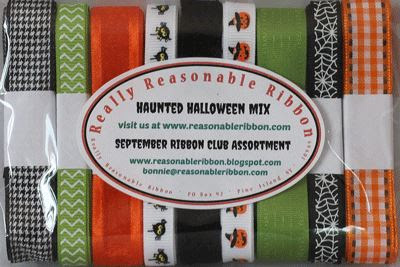 Really Reasonable Ribbon also has all the supplies you need to create lovely hair bows (of every size) and head bands. This bow uses lots of the fun ribbons from this month's Ribbon of The Month Club including the sweet Plaid Orange Ribbon With Black Stitching, the Delicate Stitched Satin Kiwi, Orange Organza With Satin Edge, Gladys Black Crochet Lace, Pumpkins on White Grosgrain Ribbon, Spider Webs on Black Grosgrain Ribbon, Apple Green Chevron Stripe Grosgrain, Spiders on White Grosgrain Ribbon and Circus Dot Grosgrain Orange. There's a spooky little spider in the center. How lovely together are all of these awesome ribbons? Your next stop on this hop is at the lovely and talented Teresa Horner's Blog, and I just know that she will have something amazing to share with you. 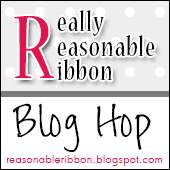 Thanks so much for taking part in this month's Really Reasonable Ribbon Blog Hop. 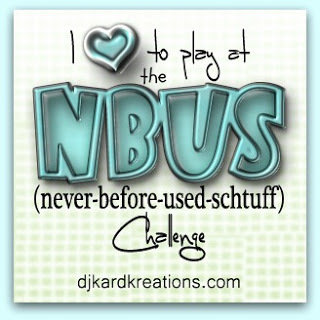 DJ Kard Kreations - NBUS Challenge #5 - The "Never Before Used Schtuff" I used on this project are my brand new ribbons, and the googly eyes! Thanks for the FUN challenge. I hope when my Granddaughter gets bigger, she'll want to wear cute hair-bows like this! You did a fantastic job! That is one spooktacular bow, Karen! Very cool idea:) I have never thought to make a hair bow. Your ribbons and hair bow is scrumptious! I love the spider in the middle of all the ribbons! Hey, Karen. This hair bow is so cute. The colors together are beautiful. Love the cute little spider in the middle. Love this so pretty but spooky enough for halloween season too and what well dressed witch wouldn't want something this pretty in their hair thanks for sharing. 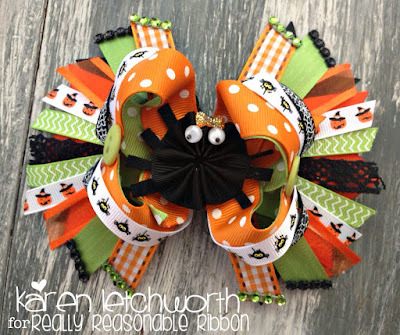 What an adorable Halloween bow Karen. I just love your cute (not scary) spider. Some lucky little girl is going to squeal with delight when she gets this bow! Your bow is just too cool I love all the different ribbons, and the bling on the ends. That spider in the middle makes a nice touch. Thank you so much for sharing. It's a beautiful monster spider and I love it!! The bow with the colorful ribbons is so beautiful. Love the little cute spider in the middle. Will have to try this. Love the cute little spider in the middle with the beautiful colorful ribbon bow. Great job. Totally adorable bow! I am in awe!!! Love the bow, esp. the spider. The bow you created is super adorable!! Great bow, and love the spider! Your bow is very pretty, even if it is spooky! Great job! This is one of the cutest hair bows that I have ever seen!